I'd like to thank everyone for granting permission to print these comments. Please visit the Rainnea Blog which we're now using for new updates. to tell you how far it exceeds my expectations. You've done wonderful work! I was hoping for something special, and you rewarded me with that and more. It's a delight to find genuine craftsmanship and artistry. I'll be proud to wear and use my black knife, and I'll happily refer anyone who asks to Rainnea. Thank you once again, Rab. I'm delighted!" "Recieved the Sgain and kilt pin at the weekend. They are just what I was looking for. The quality of work is absolutely excellent and almost impossible to find anywhere else. 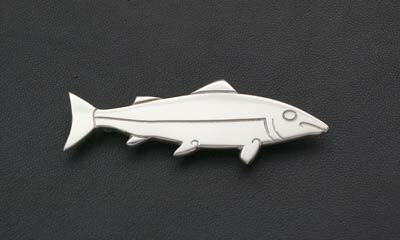 Thanks very much for the tie pin. Will be more than happy to recommend anyone to your shop." 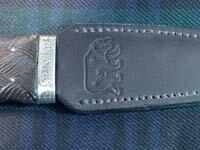 "The Sgian Dubh arrived last week and it surpassed all expectations. Thank you for the most expeditious delivery and an item which I am sure will be a future heirloom. I will be ordering again." "I received my sgian dubh today and it's magnificent! The engraving looks just as I had hoped and the carving on the handle is amazing. Thanks for building such a great piece . . . I'll wear it with pride." "I received the Sgian Dubh today. Thanks very much for the quick delivery and for expediting the order. Thanks also for the extra crest. The knife looks great. I'm sure it will become a family heirloom. Wonderful work." "I received the order of the Sgian Dubhs's this morning. They are both beautiful - something really very special. Thank you so much for taking time on these - I know they will be very much appreciated." "The guys were floored by them, and I couldn't be happier with the work you did. I really appreciate everything you did, your patience, and your attention to the deadline. Thanks again for your craftsmanship and excellent service, it was a pleasure working with you on this." It is difficult to find quality products such as this these days. "It's arrived... thank you. Really really gorgeous, even better than expected. I just love the bear motif and the carving on the handle is amazing. I can't wait to see my husbands face when I give it to him." 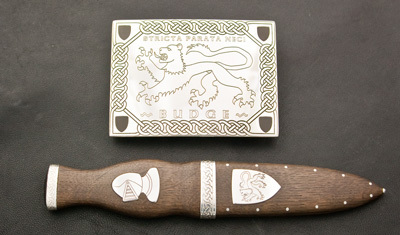 "I have received your sgian dubh and it is beautiful. I wanted my husband to have a sgian dubh that he could proudly keep forever, and I am sure this will delight him. Thank you very much for providing an heirloom product and for your time." effect of rendering its recipient speechless when he saw it. I'm sure it will be worn with pride for many many years to come." "Stuart loves his Sgian dubh, he says the weight, balance, feel and workmanship and quality are outstanding. Thank you so much. He is a truly difficult person to buy for, and it was so lovely to give him something that he will cherish always." As I come from a Scottish family and having a great interest in the history of Scotland when I ordered a Sgian Dubh I wanted something which was close to an original one. The Sgian Dubh which I received from you on Saturday made from Culloden Bog Oak with a Damascus Steel blade exceeded my expectations. It is a work of craftmanship, it is unique and is an item to treasure for ever. I can only say I am highly delighted with the end result. Thank you. My sgian dubh arrived today.....Simply awesome. The handle is thick, hearty and beautiful. The blade is stunning and functional. The stone is brilliant and I love how my initials are engraved into the blade. My expectations were high to begin with and you went above and beyond. "We received the rings today. They are absolutely stunning and fit perfectly. Thanks for your kind wishes and for doing a brilliant job on the rings. Regards, Jennifer and Keith"
"The belt buckle designed specifically for Leo's engagement present was a challenging ask, as we wished to have interlocking celtic lions in the centre of the buckle with a celtic pattern around the outside - although you would not have thought it was challenging from the impressive way Rab approached the request. The design was created by Rab and cannot be described as anything less than exquisite and superb! The end result was even better than we had imagined and it certainly helped to make Leo look even more gallant at our wedding reception. Rab also created a customised Sgian Dubh for us, to be given instead of a ring to Leo, during the vows of our wedding ceremony. The craftsmanship is just wonderful and we could not have been happier with both pieces! Thank you for your time and patience with us and for also working so hard to ensure they were ready and received for the days we wanted." Marsaili & Leo Heatley, Oxfordshire, England. "The Sgian Dubh arrived today. To say I'm pleased would be an understatement. It looks just like the pictures you sent, except that the pictures don't really do it justice. the Brussels Caledonian Society's St. Andrews dinner." "I just wanted to say thank you so much for the Sgian Dubhs. They are even better than in the photos. They're perfect, just what I wanted. Sgian Brew tomorrow. Should be a great surprise for him. Thanks again." SG241B ~ Mammoth Ivory handle with Sterling silver fittings and a Damasteel blade. "SG241B arrived a few hours ago. I enjoy my new knife. You have done a great job. It's a very harmonius and well made knife. Quality, Rab. As a part-time knifemaker I know that you have had quite a few sleepless nights making this knife. 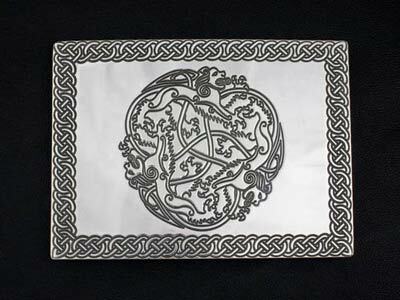 Thank you for your great work ......."
SG586 ~ Sterling silver kilt belt with Caithness slate inlays. 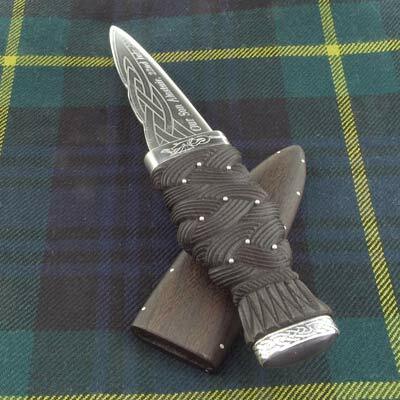 Sgian Dubh in oak with silver fittings and Caithness slate pommel stone. 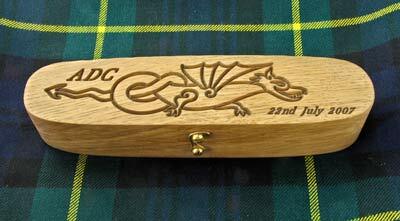 "We had a great Wedding thanks and the sgian dubh arrived just in the nick of time so all was well. really pleased with the finished items and they were well admired on the big day and compliment my Budge tartan. SG429 ~ Culloden Bog Oak handles & sheaths. 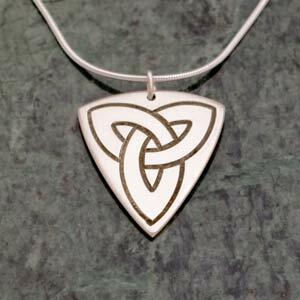 Damasteel blades, silver fittings and pommel stones set with each brother's birth stone. "The sgian dubhs are superb. Both my brothers loved them. They were well worth the wait. I'll let you know when I need a set of dress dirks to match them." SG538 ~ Ebony handle and sheath with Sterling silver fittings and a Damascus blade. "Thanks so much for the Sgian Dubh - it is absolutley stunning & Adam wore it with pride on our wedding day." SG720 ~ Rosewood, Silver and Damascus. 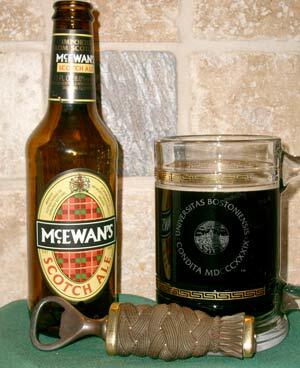 "Hi, I received the sgian dubh yesterday, I'm extremely pleased! I was already impressed with the photos of it on your site, but seeing it in person far exceeded my [high] expectations! In short, it's a beautiful work of art that I'll wear with pride for as long as I'm around! Without hesitation, I'll be recommending your work to my kilted friends!" Marc, Ontario, Canada. 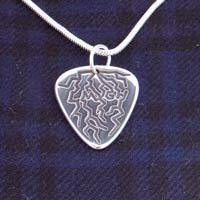 "I wanted a Celtic Hound pendant as a commemoration of my dear Dog Shaka when he died. He had traveled with me to Scotland from America and was my fellow adventurer for many years. I found Rainnea Ltd on the Internet and realised their style of work was exactly what I wanted. 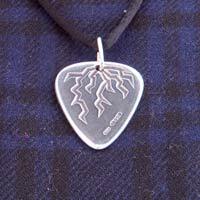 The pendant is beautiful and very comforting to me, being especially meaningful because it is one-of-a-kind, made by such a fine artisan." SG335 ~ Culloden Bog Oak handle and sheath. 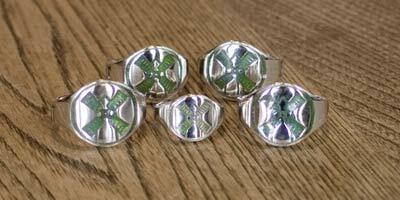 Silver fittings and clan crest inlay. Montrose Onyx Agate pommel stone. Damascus blade engraved with names and wedding date. 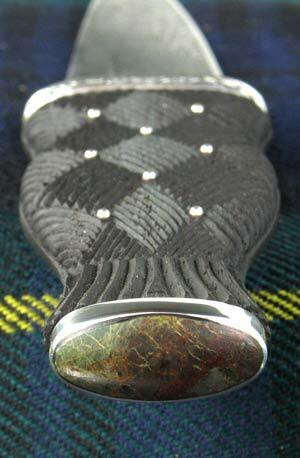 "Ian absolutely loved his Sgian Dubh, he couldn't believe it and was very pleased. I have attached some pictures for you to see." 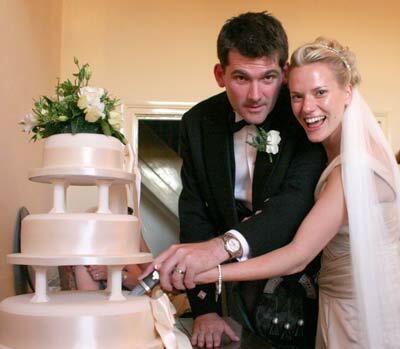 Left: Using Ian's special Sgian Dubh to cut their wedding cake. SG511 ~ Rosewood Handle with Sterling Silver Inlay and Damascus Blade. "we were delighted with it, thankyou for all your hard work. Several people asked about you on saturday night so we gave them your cards, thankyou again and hopefully we can do business in the future"
the service, beautiful and personalised." Paul was absolutely made up" Gerry Lloyd, England. 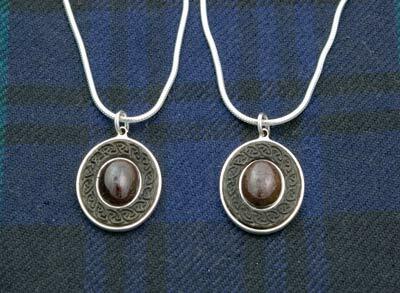 Scottish Garnets set in Sterling Silver and bog oak surrounds with Celtic knotwork carving. "what a perfect setting you've designed for these wonderful Scottish garnets for the two most important ladies in my life"
"Rab, The Sgian Brew is phenomenal! The quality is out of this world! " Handle: Stag Horn from the hillside by Loch Ness with Culloden Bog Oak and Sterling Silver top stud. treasure. Your remarkable artistry and aesthetic taste have produced a singular work of art in this piece. It is beyond my expectations and I hope to meet you someday on a trip to Scotland and shake your hand." Tracy McCallum, New Mexico, US. "My custom sgian dubh arrived today and I must say that I still cannot find the words to describe my pleasure. Your work from start to finish is beyond my highest expectations! You truly are artist with the highest degree of skill and attention to detail. Aristotle would have been proud to have you as a pupil, because if there was ever a perfect "sgian dubh", you captured it's essence in creating mine. I commend you, and I will heartily recommend you to my Clan Macpherson(Newtonmore & Kinguissie) if anyone wants an heirloom and work of art." 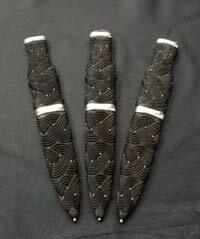 "The Sgian Dubh arrived safe and sound last Monday and it is BEAUTIFUL. My husband is over the moon with it. He couldn't stop looking at it when I gave it to him! The craftsmanship is outstanding and thank you for making it in time for his birthday. I can't tell you enough how pleased we are with it, it is truly a work of art." SG374 ~ Rosewood with brass fittings, brass Celtic knot inlays on both sides with names engraved. "SG 374-- An elegantly simple design,executed with superb workmanship -- a tribute to Rab's skills----and giving a record of Family History for future generations"
SG433 ~ Culloden Bog Oak handle and sheath with Sterling silver fittings and a Damascus blade. "Mike is overwhelmed by the Sgian Dubh. The workmanship and attention to detail far surpassed anything i was expecting. It will be handed down to our son Mikey when Mike is done with it, and we hope, for generations to come. You certainly made his day when he opened it on our wedding morning. 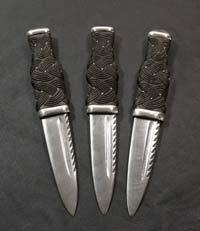 I would recommend your services to anyone thinking of getting a real sgian dubh as opposed to one of those plastic things you get in kilt shops." SG384 ~ Culloden Bog Oak handle with Amber pommel stone, Silver Ferrules, Damascus blade engraved with special inscription. "Just to let you know that the sgian dubh arrived today. It looks fantastic. Thank you so much for making it for me. It will definitely become a family heirloom." 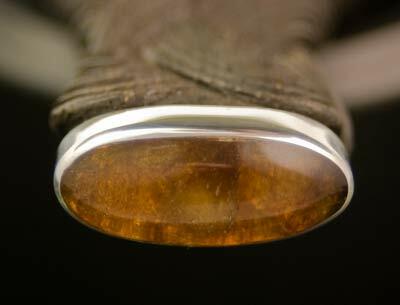 Right, close up of the Amber pommel stone. SG405 ~ Handle carved from an Isle of Jura whisky barrel, Sterling silver ferrules with engraved initials, Damascus blade with bottle opener.
" a pleasure to work with Rab, detail oriented and a true craftsman.."
"...a piece of ART that I will be proud to pass on to my son one day"
Jeffrey House, North Carolina, United States. SG294 ~ Ebony handle with Sterling silver clan crest inlay and ferrules, sharpened Damascus blade. 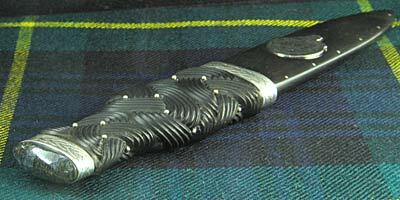 "The Sgian Dubh arrived today... and I have to say that the workmanship is very, very good indeed. Your attention to detail is wonderfully meticulous." "The sgian dubh that I recently ordered from you arrived today, and it is everything I had hoped for and more. In fact, I believe it is the best made and balanced one I have ever seen. I have had the honour to examine several antiques, and this one is the equal to any of them. For years, I have worn a "Made In ?" sgian dubh, and have searched for a real one, with a real blade, that I would be proud to wear, and now I have at last found it. Please keep up the fine work. I will recommend you to other customers. 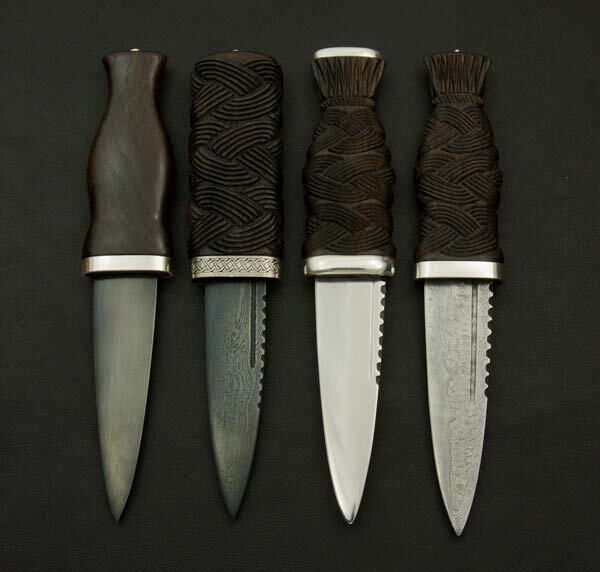 Lieutenant to the Chief of the Name of Bruce"
"I thought it best just to drop you a quick line to say how much I admire and appreciate the work and craftsmanship which went into making the Sgian Dubh which Lesley got from you for my birthday - it really is quite stunning." SG332 ~ Culloden Bog Oak handle and sheath. Matching presentation case made from Glen Urquhart oak. "Just a note to let you know I couldn't be more pleased with Alastair's Sgian Dubh & case. The workmanship and quality of the items is just fantastic. I had an idea of what I wanted however with your invaluable help, the finished items have exceeded my expectations." Presentation case with the recess hollowed out from solid oak. 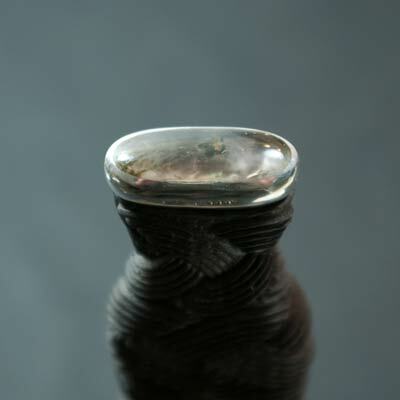 "I did many a trek up the Royal Mile looking for a Sgian Dubh to wear for the celebration. Well I have to tell you, although you possibly know any way, that all the ones for sale were either plastic or approaching that and probably made in China. It was not until after that I saw your website and thought this is what I am looking for. And you did not disapoint. The sgian dubh is a work of art and I will treasure owning it for many years to come. Thank you again for your service and quality." "The beauties arrived today. Wow, simply incredible. It was such a pleasure to work with you and Roddy on this, and the results are more than I had ever hoped for. I hid my son's and will give it to him at dinner this Saturday night, as he will compete Sunday morning. Cannot wait to see his face light up when he sees what's in the box for him!" "I wanted to let you know how much my new husband loved his gift on our wedding day. He was totally blown away and couldn't stop showing it off to people, all of whom commented on how unusual it was. 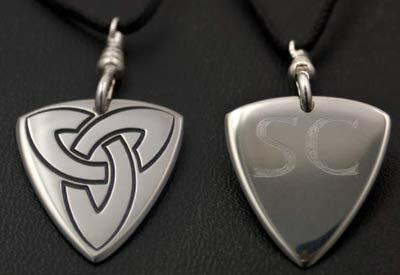 So beautifully crafted and a truly personalised gift. You were a pleasure to work with on this. Thank you so much for all your hard work - the result was a real piece of art." "Thanks! I'm very impressed. It was particularly nice to have a piece of Bog oak from an area near the battlefield where my ancestors fought and the wolves engraving representing the family crest works very well. Once again well done!" "SG 224 arrived this morning, it was worth the wait, a beauitful peice of craftsmanship. I will value it the rest of my life, once again thank you. " "Sgian Dubhs arrived safely. Am really happy with them. They are every bit as beautiful and well made as I'd hoped. Thanks for all your hard work and care and attention to detail over these." 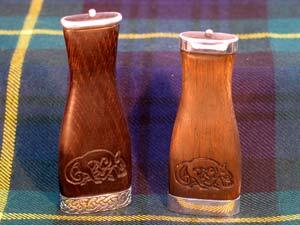 Culloden Bog Oak and Glen Urquhart Oak handles with Pictish Hounds and Sterling Silver fittings. "I knew I was waiting for something special, but this beauty is beyond expectations! Awe inspiring craftmanship and quality The texture of the heavy damascus blade is mesmerizing, the ebony handle and silver fittings make it complete...a work of art, heirloom stuff. I'll wear the sgian dubh with pride. Highly recommended...thanks Rab! " Culloden Bog Oak handle, Sterling Siver fittings and Damascus blade. Special engraving for a christening present. "The Sgian Dubh arrived this morning and it's even better than I could have hoped for. I'm very pleased with it. Many thanks for your help with this." 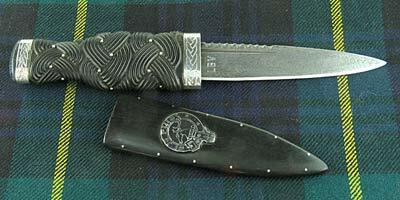 "The sgian dubh and sheath are beautiful! Thank you for your patience and communication throughout this process. Your work is as genuine and artistic as anticipated from the website. 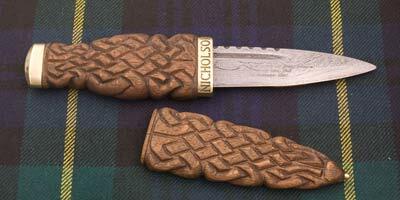 This sgian dubh will be treasured always by our family." "I cannot describe how pleased we are with your work. Beyond expectations! It is truly beautiful and I cannot wait to give it to my groom. Thank you so much for all of your hard work and correspondence to deliver such an exquisite piece." 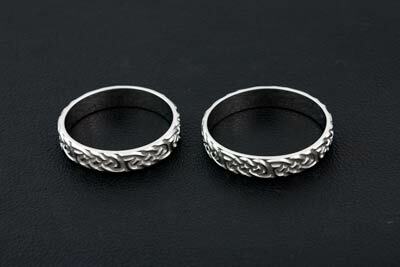 "It is just what I wanted to go with my kilt; authentic, subdued, elegant and of fine craftsmanship. I will certainly recommend you to friends and family. It is rare today to find someone who obviously takes pride in what they produce. " "Thank you, I received my Sgian Dubh today, I am so happy with the way it turned out." "Hi Rab, I just received the knife today and I am very pleased with it. It is exactly what I was looking for." "It looks great and is what I hoped for. Love the handle and the silver work." "Just a quick email to let you know how pleased I was with the sgian dubh I ordered for my partner. I was really pleased with the amazing craftsmanship, quality and prompt service and am sure he will be delighted :-) Many thanks "
"Dear Rab, The Sgian dubh arrived today and is wonderful. It is everything I expected and more, thank you for your work and rest assured I will treasure it." "the one thing I wanted to bring home to New Zealand with me, was a good quality Sgian Dubh. I looked and looked, but everything looked so mass produced or “plastic”, until I saw the items on display from your Studio. I purchased SG176, it's absolutely beautiful and I will treasure it, as well as use it while camping and hunting. I feel it's something I could keep and hand onto my children, that's how much I value it!" "Just a note to say thank you for the beautiful Sgian Dubh. Al wore it with pride on our wedding day and it was much admired both in Scotland and Alberta, Canada." 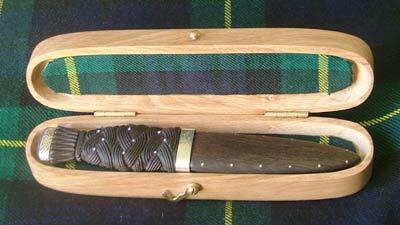 "Bonsoir Rab, just a quick note to say that the Sgian Dubh arrived safe & sound this morning. The actual knife is better than I had dared hope for, a beautiful but simple piece of craftsmanship, absolutely what I was looking for." 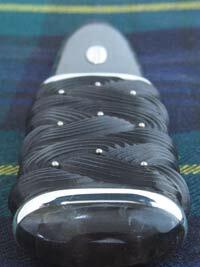 "Hi Rab, My Sgian Dubh arrived this morning and is absolutely gorgeous. I'm delighted and will be proud to wear something so unique and Scottish with my kilt on my wedding day. Thanks for all your help and advice. I will recommend you!" I've had a chance to 'pick it up and admire it' and I am very pleased with it! It's got an honesty and integrity that many of the others I've found on the net don't have." "Thank you very much for your prompt attention to our order. 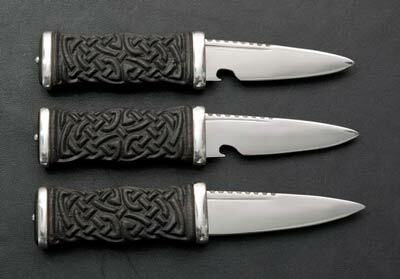 We are more than satisfied with the Sgian Dubh, beautiful work, and a good feel to it. Many thanks." "I'm quite delighted with it. It is something to have such a functional work of art & be able to wear it! I will look after it." "I'm especially pleased with the bear sgian! You did a wonderful job. Thank you so much for taking the time and care that you did." 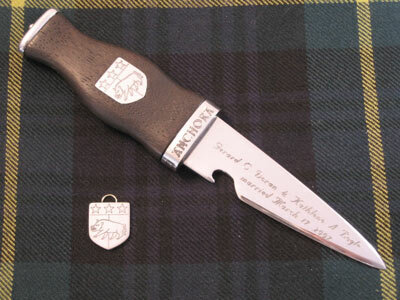 "We were looking for a Sgian Dubh for the son of close friends to complete the Highland dress he was being given by relatives and friends to celebrate his 21st birthday. We wanted something a bit different, and after browsing several other websites, we found Rainnea. We were immediately impressed by what we saw, especially the Culloden bog oak handles. 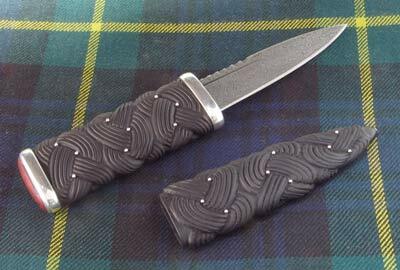 After a phone call to discuss what we wanted, Rab Gordon agreed to design a Sgian Dubh with a bog oak handle and Scottish silver blade engraved with a traditional Celtic patterns. He emailed us digital photos of possible designs and called us to discuss the fine detail. 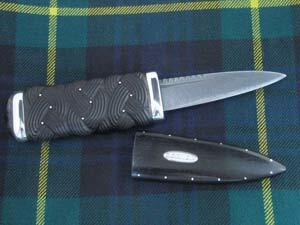 Once we had agreed the final design, the Sgian Dubh was produced, hall-marked in Edinburgh, and despatched extremely promptly. The lad was delighted with his gift, and several male generations of his family were highly covetous!! It was a pleasure dealing with Rainnea and the service provided was excellent - we look forward to dealing with them again in future." "It is fabulous and is exactly what I was looking for. The Scottish re-enactors at the Ren Faires in my area will be drooling over it when they see it. If any of them are interested in picking up something of this level of authenticity, I will refer them to you." "it is beautiful, certainly a fine work of art. thanks again for everything." "Thank you so much Rab - it's absolutely beautiful; it looks amazing and feels good in the hand. You have done a great job and I am sure that my friend will be surprised and thrilled to receive this. Thank you once again for making my day!" Kind regards, Liz Rivers, Isle of Man. 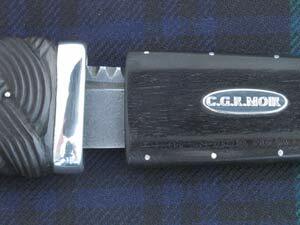 SG331 ~ Ebony handle and sheath, silver ferrules, inlay and pins, real Cairngorm pommel stone. "It arrived - fantastic. I am absolutely stunned. It is very rare that something is actually better than you'd imagined. Thank you very much and thank you for managing to do it within such a tight time scale." SG360 ~ Ebony handle and sheath, silver ferrules and pins, Fife red jasper pommel stone. "Just wanted to let you know that my blade arrived today in good order. 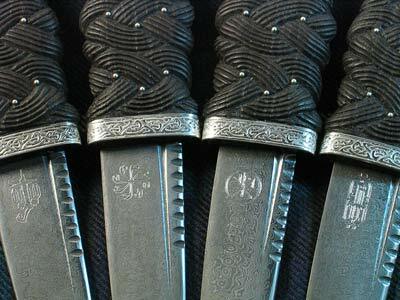 Personally, the carving on the handle is my overall favorite, but the damascus blade is a close second." SG290 ~ Ebony handle and sheath, silver ferrules and pins, Moss Agate pommel stone. 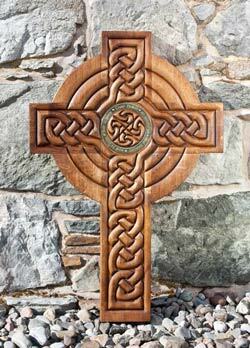 "When our 24 year old son died in 2008, we desperately wanted a Celtic memorial cross to be carved for his memorial. We found Rab & Tanya's site purely by accident. We asked Rab if we could commission a cross, and although this is most certainly not his normal type of project, he was very happy to take this on. For Tony & myself, and indeed everyone who has seen this finished cross, we all think that is truly stunning and a work of art and craftsmanship. We both feel so privileged to have been able to work with Rab, a true gentleman. He has given us the most precious thing we could have asked for. More so, we actually collected Grants cross from the beautiful" Rainnea" and had the pleasure of Rab & Tanyas company in their beautiful home.We hope that we will continue to stay in contact, and visit you both when we next come to Scotland. X"